Ottoia prolifica Walcott, 1911 is a 500 million years old fossil cycloneuralian worm from the Burgess Shale, Canada, British Columbia. We report newly observed details of the morphology and ontogeny of this species. Previously unknown details could be observed by applying crossedpolarized light. This approach revealed that the tail end is equipped with six hook-shaped spines and that the scalids in the anterior retractable region, the introvert, are arranged in at least 30 radii. Furthermore, an ontogenetic change could be observed: earlier developmental stages have an elongate worm-shaped trunk, while the trunk of adults is pronouncedly bellied. The newly observed details of Ottoia prolifica raise questions about the taxonomic status of other Cambrian cycloneuralians and about existing homology hypotheses for cycloneuralians. Evolutionary developmental biology – Evo-Devo – has significantly shaped our view on the evolution of living organisms. Developmental biology with a true deep-time component–Palaeo-Evo-Devo–demands for fossil species with reconstructable ontogenies, so-called fossilized ontogenies. A challenge for reconstructing more or less complete ontogenetic sequences is the fact that earlier and later developmental stages appear to have a different potential for becoming fossilized. Environments that favor the preservation of earlier developmental stages can be disadvantageous for preserving the later stages and vice versa. For the earliest geological period in which definite metazoans (animals) occurred, the Cambrian (more than half a billion years before present), we have examples for both cases. An impressive example of a fossil preservation type providing access to early parts of developmental sequences is phosphatic micro-faunas. Especially the Orsten-type of preservation, which also preserves 'soft parts', has offered a view into early developmental stages, which are often only 100 μm long, with tiny structures down to 0.2 μm in diameter. Fossils in Orsten-type of preservation never exceed two millimeters in size  and thus adults or, in general, late developmental stages are rarely found and restricted to cases in which the adult itself is tiny [2,3]. An example for a fossil preservation type favoring later developmental stages is the Burgess-Shale-type of preservation [4-7]. This type preserves especially macrofauna and thus includes older developmental stages, with specimens of several centimeters in length. Smaller specimens of only few millimeters also occur, but the amount of observable detail is usually rather poor when compared to the centimeter-sized . Especially arthropods (the group including insects, crustaceans, myriapods, spiders and their more distant relatives) from the Cambrian have been in focus of attempts for reconstructing developmental sequences. Ontogenetic sequences with up to thirty successive instars could be reconstructed for the branchiopod crustacean (relative of fairy shrimps and alike) Rehbachiella kinnekullenis Müller  from the Orsten, and this sequence is still incomplete, lacking the late juvenile and adult stages . Another eucrustacean from this Lagerstätte, the thecostracan Bredocaris admirabilis Müller  (relative of barnacles and alike) is known with a complete ontogenetic sequence with seven instars . Also other eucrustaceans from these deposits have several ontogenetic stages preserved, but also derivatives of the earlier evolutionary lineage of crustaceans are known from this Lagerstätte, allowing the reconstruction of evolutionary scenarios of changes of the ontogenetic sequence [11-13]. Yet, besides arthropods also cycloneuralians are known from the Orsten. Cycloneuralia is a group of worm-like animals including five major morphotypes: Nematoda (round worms), Nematomorpha (horse hair worms), Kinorhyncha (mud dragons), Priapulida (priapulid worms) and Loricifera (tiny creatures resembling priapulid larvae). Most famous among the cycloneuralian fossils from the Orsten are the different species of Markuelia, which are known exclusively from their embryonic stages . Furthermore, larval stages of early cycloneuralians . priapulids and possible loriciferans  have been found in Orsten-type preservation, providing insights into the ontogeny of these half a billion years old worms. Also in the case of the Burgess Shale, a focus appears to have been on arthropods, with (parts of) developmental sequences described for Marrella splendens Walcott [8,17-20]. We present first evidence for the preservation of developmental stages of a cyclconeuralian species from the Burgess Shale, Ottoia prolifica Walcott, 1911. It is also the first report of developmental stages of a fossil cycloneuralian not preserved in Orsten-type preservation . We discuss possible consequences of our newly observed details onto our understanding of Cycloneuralia as a whole. All specimens of Ottoia prolifica investigated for this study are part of the collection of the Smithsonian National Museum of Natural History, Washington, D.C. (USNM). 31 specimens have been documented. The specimens have been documented dry under crossed-polarized light with a Canon EOS Rebel T3i camera, either with a MP-E 65 mm macro lens or with an EF-S 60 mm lens, and with a Canon Macro Twin Lite MT-24EX flashlight. Several images were taken of each specimen and stitched with the Photomerge function of Adobe Photoshop CS3. 19 of the specimens have been measured on the images (Table 1). The measured parameters comprise trunk length and maximum width. 3D models have been reconstructed in Blender, based on the new images and on published images of Markuelia specimens [22,23] and of the nematomorph Chordodes morgana . Additionally, one specimen of another cycloneuralian from the Burgess Shale, Lecythioscopa simplex Conway Morris  (USNM 83937), was documented under the same conditions. Table 1: Measurements on specimens of Ottoia prolifica. Ottoia prolifica has been studied intensively by Conway Morris  and re-studied by Vannier . We focus in this description on general aspects to give the reader an idea of the general morphology, aspects that will be important for the evolutionary discussion and newly observed details. The newly observed details are mainly facilitated by the application of polarized light. Most details described by Conway Morris and Vannier [25,26] stay entirely valid and are consequently not repeated here. Ottoia prolifica is a worm-shaped animal. Its body is organized into an anterior, presumably retractable region, the introvert, an annulated trunk, and a distinct trunk end. The size varies between slightly more than 20 mm to significantly over 100 mm. The body organization does not change throughout the observed ontogeny. The anterior introvert is interpreted to be retractable. This retractability is indicated by the different states of the retraction preserved in various specimens ; this interpretation is supported by a functional comparison with modern relatives. When everted the introvert appears more or less ball-shaped, although slightly depressed in anterior-posterior dimensions. This means the largest circumference is in the middle of the introvert (in anterior-posterior axis); it has a larger diameter than the circumference at the anterior or posterior part of the introvert. The surface of the introvert is covered with numerous small structures. These teeth-like cuticular extensions are slightly too strongly curved and sometimes appear hook- or sickle-like (Figure 1E). They are interpreted as scalids; scalids are characterized by a tiny distal opening and are hollow; both aspects cannot be substantiated due to preservational aspects. Yet, based on comparison with extant relatives it is seen as most likely that these structures are true scalids. In order to avoid confusion by introducing another term for these structures we will address them as scalids in the following, despite the preservational uncertainty. Figure 1: Morphological details of Ottoia prolifica Walcott, 1911. A Anterior view on introvert of late juvenile with scalids; USNM 188597. B Scheme for the scalid arrangement of the specimen depicted in A. Three scalid-bearing rings could be detected; black: scalids clearly present and assignable to one of the three rings; grey: scalids that are present, but with unclear assignment to any ring; white: possible scalids. C Anterior body end with pharynx everted, exposing the scalids (below) and pharyngeal teeth (above); USNM 172983. D Close up of pharyngeal teeth; USNM 188594. E Close-up of the scalids on the introvert; USNM 188594. The scalids point backwards when the introvert is extruded, but face forward when the introvert is retracted. The exact arrangement of the scalids is in most cases not reconstructable due to the orientation of the fossils; in lateral aspect it is difficult to identify specific radii on which the scalids are positioned. In one specimen (Figure 1A; already used by Conway Morris  the introvert can be seen from more or less anterior and allows the reconstruction of the arrangement of at least some of the scalids. Three rings of scalids can be identified (Figure 1B). Mapping the scalids on these three rings indicates that the scalids are arranged in 30 radii, yet in no ring all radii are occupied. The specimen with the introvert preserved in anterior view is not one of the largest specimen (it is the largest of the juveniles, see below). Some larger specimens preserved in lateral view appear to have more than 15 radii visible; assuming that a laterally preserved specimen has only half of its radii exposed; this indicates that fully grown specimens could have arranged their scalids in more than 30 radii. About seven or eight rings of scalids appear to be present in adults (Figure 1C). Besides these rings of hook-like scalids, a ring of straight structures is present anterior (in everted introverts) to the scalid rings (Figure 1C). At the anterior of the introvert is the mouth opening. From this an armed pharynx, also equipped with numerous cuticular structures, can be everted. It remains partly unclear whether the straight structures (just mentioned) are specialized scalids and part of the introvert, or whether these represent the first ring of structures of the pharynx. The pharynx is presumable tubeshaped, its diameter appears to be more or less constant, in everted position, along its entire length. The total length, when fully everted, is about five times as long as wide. The pharynx is armed with numerous teeth (Figure 1D), which are facing forward in everted position, i.e. they are directed in the opposite direction then the scalids are (this could be seen as an indication that the straight structures are indeed a first ring of pharynx teeth). Up to 20 radii of teeth can be seen in laterally preserved specimens; this indicates a total number of 40 radii. Also about 40 rings of pharynx teeth are visible in a fully everted pharynx. In a single ring it appears that each second radius is occupied, this would make 20 teeth per ring. In the next anterior or next posterior ring the radii are occupied which are left free in the preceding ring. The pattern may in fact be more complex but can currently not be resolved further. The very anterior area of the pharynx, about as long as the diameter, is unarmed and appears sack-like. The introvert is followed by the trunk. The transition is rather abrupt. The trunk of Ottoia prolifica is strictly annulated. There are between 70 and 100 annuli (Figure 2D–2F) . At the anterior end the trunk has (naturally) the same diameter as the introvert, but the trunk widens towards the posterior. In adults the maximum width is about twice the width of the introvert (Figure 2D). Due to the flexibility of the body, the ratio of width versus length is variable to some degree. The maximum width (diameter) is reached between the middle of the trunk and two thirds of the length towards the trunk end. Further posterior the trunk decreases in width again. At the trunk end the body diameter is only two thirds to half of the diameter of the introvert-trunk transition. The trunk appears to have been always curved or bend; there seems to be no specimen that is truly straight. Specimens that seem straight in fact appear to be preserved tilted, so that the curvature is not so apparent. Consequently, we interpret this bend as a true morphological feature of O. prolifica. The bent (concave) body region is interpreted as ventral; the outer convex side is interpreted as dorsal based on comparisons with extant cycloneuralians. The curvature is between 90 and 180 degrees. The curvature is mostly expressed from the middle of the trunk towards the posterior. Thus the curvature could be varied, most likely as a part of the movement pattern. The anterior trunk region is straight. Figure 2: Morphology of Ottoia prolifica Walcott, 1911. A. Posterior body end with everted bursa (pointing upwards); USNM 172978. B Close-up of the tail spines; USNM 188637. C Detail of the tail spines; USNM 172978. D Entire adult specimen; note the thickened trunk; USNM 188615. E Smallest juvenile in the material, with slender body; USNM 083939. F Juvenile specimen slightly larger than in E with partly thickened trunk; USNM 188617. Although the length to width ratio is slightly variable, there is a recognizable change of the length to width ratio during ontogeny. With increasing body length the length-to-width ratio of the trunk decreases; in other words, younger (smaller) specimens are more slender than older ones (compare Figure 2D and 2E). Mapping of length versus width on a scatter plot leads to two well-distinguishable clusters (Figure 3). This strict separation of the two clusters is most likely a sample bias, intermediate specimens should have been present in the original population. Although their strict separation being most likely an artifact, these clusters indeed differ in an interesting aspect. Figure 3: Scatter plots of measured lengths of Ottoia prolifica Walcott, 1911. Different numbers in the right plot indicate different life phases (distinguished by different morphologies). Abbreviations: l=trunk length; w=maximum trunk width. Mapping trend lines in the scatter plots of length/width ratio versus length for both clusters separately leads to very different slopes (Figure 3). This indicates that these two clusters represent two phases of the life history. The phase with the fast dropping slope is interpreted as a distinct juvenile phase in which the body shape changes from an elongate body to a more bellied body in the adult. The almost flat slope of the trend line during the later phase indicates that the body shape remains more or less constant in the second phase, interpreted as the adult phase. The trunk end can be partly inverted and a bursa can be everted from it (Figure 2A; see also Conway Morris; Vannier) [25,26]. The trunk end is armed with with six hook- to sickle-shape tail spines (Figure 2B and 2C). Conway Morris reconstructed the trunk end of O. prolifica as bearing eight hooks . He states that never more than six of these are visible. Conway Morris argues that, based on the special pattern observed in different specimens, the presence of eight hooks could be the only explanation for the observed variation in these patterns . This argumentation appears very reasonable; however, during a re-investigation of his original material we did not find support for this assumption. For the re-investigation we applied mainly crossed-polarized light imaging, a technique that was not yet available when Conway Morris re-described O. prolifica in 1977[17,18,20,26-28]. With this imaging technique stronger sclerotised structures, such as the hooks at the tail end, can be often seen through the overlying cuticle, but no indications of extra hooks pointing to a number of more than six could be observed in any of the specimens. We, therefore, agree with Conway Morris' observation that there are never more than six hooks preserved on the tail end of O. prolifica. Yet, we disagree with his conclusion that there must have been eight hooks present. Instead, we think that the number of six hooks most likely represents an original condition and that the variation of the arrangement on the fossils could be explained by the embedding variation of a softer body, especially as the hooks arise from a region which could be partly retracted and everted . The exact orientation of the hooks is difficult to evaluate. In most cases, but not in all specimens the central hooks appear to be oriented ventrally. 1) Many computer-based analyses rely exclusively on literature data. For example, the main data source for cycloneuralians from the Burgess Shale is the monographic work of Conway Morris later works strongly focus on functional morphology . The study of Conway Morris is a very comprehensive one; yet, since the time when it was conducted new material of the species has been found, new documentation techniques and new digital enhancing methods have been developed. Thus, instead of applying new generation cladistic computer algorithms to old data, more effort should be taken in re-investigating the original material . The present study is seen as a part of such an enterprise. 2) Many computer-based analyses do not intensely discuss character conceptualization. Character conceptualization is a central aspect of evolutionary morphology . In cycloneuralians this comes down to the problem of homologizing structures, especially of fossil versus extant representatives. This aspect is indeed a very deep-reaching problem. It is already recognizable in the terminology of the group. Fossil cycloneuralians from the Cambrian are generally addressed as priapulids [25,31,32]. Yet, this ascription is far from clear. Most of the Cambrian cycloneuralians are likely to represent scalidophorans, the group including Kinorhyncha, Loricifera and Priapulida. But, in many cases also a nematoid affinity cannot be a priori excluded . Another difficulty is, for example, the description of the introvert and pharynx. In fossils these two have been collectively addressed as “armored proboscis” which was subdivided into four zones following Conway Morris . In modern representatives there is a clear distinction between pharynx and introvert, and the mapping of structures in these two areas into radii is an important character. Maas et al. have discussed difficulties of homologizing different zones of introvert and pharynx among extant cycloneuralians and fossils . The original discussion of Conway Morris included mainly fossil scalidophorans and extant priapulids . According to the knowledge of that time, it did not include Kinoryncha, Loricifera or Nematomorpha, but included Acanthocephala (thorny-headed worms) which have been later shown to be not closely related to scalidophorans. As a consequence, the direct homologization of structures of fossil scalidophorans with those of priapulids, without a detailed consideration of the other groups, will very likely lead to a close relationship of the two, but which might be based on erroneous presuppositions. This is exactly what is found in many analyses of the recent years [23,32,34]. Hence, it might well be an artifact caused by the incomplete character conceptualization. On the other hand, important characters used in extant phylogenies of cycloneuralians are not accessible in fossils or have simply not been investigated yet . This includes inner structures (yet, gut details are described for O. prolifica in Vannier), but also details of the outer morphology. For example, mapping of scalids and teeth into radii has been rarely attempted for fossils [33,34]. In summary, before applying a computer-based phylogenetic analysis we propose to 1) re-investigate the crucial fossil species with up-to-date imaging methods and 2) provide a sound character conceptualization based on plausible primary homology hypotheses . Only if these two points are fulfilled, new computer algorithms are likely to provide more reliable results than older studies. In consequence, we will discuss our new insights into the morphology of O. prolifica in a phylogenetic framework that is largely based on an extant phylogenetic framework of cycloneuralians. We will restrict our discussion to comparing evolutionary scenarios resulting from different phylogenies. Concerning evolutionary interpretations, we want to stress here the importance of developmental data, also of fossil ones as provided in this paper. This importance has been put forward for arthropods from the Burgess Shale . Recently published possible con-specifities of (likewise fossil) dinosaurs, with the representatives of one species possibly representing early juveniles of those of another species, furthermore serve as an illustrative example. Here the supposed conspecific stages resulted in some phylogenetic analyses as close relatives on the tree, but occurred in other cases as far apart from each other [35-37]. If a single species occupies two totally different positions in a single tree, this represents a severe artifact. As a consequence, we will include a discussion about developmental aspects of fossil species in our evolutionary interpretations. Our new finds on Ottoia prolifica raise a taxonomic problem concerning the famous fossil embryos of Markuelia. Among the fossil cycloneuralians, Markuelia is an exception; it has been repeatedly investigated with up-to-date imaging methods. All known specimens of Markuelia represent embryonic stages of an elongated worm that is tightly coiled up into a spherical form (Figure 4A) [22,23,38-43] head and tail are juxtaposing each other and the body is arranged in a typical S or anti-S shape [22,23,43,44]. The body of Markuelia is differentiated into introvert, annulated trunk and trunk end. The tail bears six latero-ventrally curving spines arranged in pairs (Figure 4E) [22,23,43,44]. Markuelia was interpreted as a scalidophoran [23,40,43,44] but also nematoidan affinities have been proposed . Despite all these details, one important aspect is to date still unknown: its entire post-hatching phase of life [44,45]. Figure 4: Interpretation of the possible life cycle of Ottoia prolifica Walcott, 1911 with a representative of Markuelia Val'kov, 1983 as a possible embryonic stage, illustrated with 3D models based on real measurements. AÃ¢ÂÂB Markuelia. A Almost natural position, introvert slightly moved outwards for better visibility. B Specimen in A artificially outstretched, indicating habitus of hatchling. CÃ¢ÂÂD O. prolifica. C Juvenile with adult-similar introvert morphology, but relatively slender body. D Adult with thickened trunk. E Tail spines of Markuelia. F Tail spines of adult O. prolifica. The central diagnostic character for Markuelia is the presence of six latero-ventrally curved tail spines [23,40] other characters, such as the special coiling pattern inside the egg cannot be used as a differential diagnostic character for discerning Markuelia from other fossil cycloneuralians). Markuelia has been hypothesized to be an early developmental stage of palaeoscolecids , exclusively fossil cycloneuralians. Trunk ends of palaeoscolecids bear one pair or two pairs of protrusions, or in some cases hooks . Yet, no known palaeoscolecid has six such hooks . Other fossil non-palaeoscolecid cycloneuralians, e.g., from the Chinese Maotianshan Shale, the Burgess Shale  or the non-palaeoscolecid 'Orsten'-type cycloneuralians have no such posterior hooks [15,16,33]. Our finding that Ottoia prolifica possesses six tail spines is significant in this aspect. O. prolifica and Markuelia share the same number of terminal spines (Figure 4E and 4F). Also the outline of these six terminal structures with their hook-like or sicklelike shape appears to be very similar in O. prolifica and Markuelia (Figure. 4E and 4F), especially in the species M. lauriei Haug, Maas, Waloszek, Donoghue and Bengtson [22,23]. In consequence, one will either need to formally re-describe Ottoia and Markuelia as separate genera based on other characters, or one should consider the possibility that Markuelia is a specific stage in the life cycle of species of Ottoia (or close relatives of it). Ottoia is known from the middle Cambrian exclusively, while Markuelia specimens are known from early until late Cambrian occurrence, hence are also known from strata coeval to those of Ottoia. We will therefore search for characters that differ between Markuelia and Ottoia . The trunk of Markuelia has 56 to 86 annuli (Figure 4B) [23,43], the trunk of O. prolifica has about 70 to 100 annuli (Figures 2D–2F, 4C and 4D) . An ontogenetic increase of the number of trunk annuli was found for Markuelia . A slightly higher number in specimens of O. prolifica would therefore be congruent with an increase of annuli during ontogeny if assuming that O. prolifica is an adult of a (yet unknown?) “species” of Markuelia; it cannot be used as a differential diagnostic character. The trunk of Markuelia is slender (tube-shaped) along the entire length (Figure 4B)  the posterior trunk of more mature specimens of O. prolifica is widened (Figures 2D and 4D . Yet, smaller juvenile specimens of O. prolifica are significantly more slender (Figures 2F and 4C). The smallest specimen of O. prolifica O. prolifica has a similar length-to-width ratio as in Markuelia specimens (Figure 2E). Consequently, also the trunk width cannot be used as a differential diagnostic character. The introvert of Markuelia specimens is armed with three to five rings of scalids with up to nine scalids per ring, assumed to be arranged in 25 radii [23,46] although due to the crowded arrangement of the scalids the exact radii arrangement remains a (likely) assumption). Specimens of O. prolifica have about eight rings of scalids arranged in at least 30 radii. Differences of scalid patterns between Markuelia and Ottoia would be congruent with a typical scalidophoran development, adding scalids and rings of scalids [47-49] possibly even slightly changing the symmetry arrangement . Also scalids cannot be used as a differential diagnostic character in this case. Markuelia specimens have a mouth cone inside the pharynx [23,46] O. prolifica has its pharynx armed with numerous teeth. The exact structure of the mouth cone in Markuelia is not deducible from the fossils. Mouth cones in extant cycloneuralian groups (loriciferans and larval nematomorphs; Figure 5C) are formed by few teeth [33,50,51]. The same principle structure could be assumed for Markuelia. The difference between Markuelia having a mouth cone (made up of few teeth) and Ottoia having a pharynx with numerous teeth could result from a simple increase in the number of teeth, similar to the differences explained above for annuli and scalids. The mouth cone is a potential differential diagnostic character for Markuelia. Yet, in extant cycloneuralians mouth cones are known from larvae (Figure 5C) or tiny adults assumed to be paedomorphic. It is thus likely that the mouth cone of Markuelia is also a feature restricted to an early developmental phase and not a useful differential diagnostic character. Figure 5: Small-sized cycloneuralians. A-B. Lecythioscopa simplex Conway Morris, 1977, USNM 83937, which might well represent an early developmental stage of Louisella pedunculata Walcott, 1911. B. Close-up of the introvert, which could represent a mouth cone. C. 3D model of a larval stage of a nematomorph, which is possibly relatively close to the ground pattern morphology. As explained above, the tail end of Markuelia and Ottoia prolifica are similar in having six hook-like spines, yet the posterior end of O. prolifica has an evertable region, the bursa, which has not been found in Markuelia. The absence of this structure could also be explainable by ontogenetic change, as modern priapulids that possess a bursa do not yet seem to have it in the early developmental stages [25,52]. We did not spot a pronounced bursa in the juvenile O. prolifica specimens, yet as there are relatively few of them this might be simply preservational. Thus, also the trunk end does not provide differential diagnostic characters for distinguishing Markuelia from Ottoia. Markuelia occurs in a relatively wide geographical and stratigraphical range, yet none of the species of Markuelia co-occurs with O. prolifica. Still we could argue that this is less problematic compared to a scenario in which Markuelia would have been known from only a single site. With an assumed almost worldwide occurrence of Markuelia in Cambrian times, a species of it could have been possibly part of the Burgess Shale community, and its factual absence can be interpreted as a preservational artifact (see above, preservation potential of Burgess Shale vs. Orsten). In consequence, we should consider the possibility that there is an ontogenetic link between Markuelia and Ottoia prolifica. It is unlikely that O. prolifica represents the adult of one of the described Markuelia species, which appear to be restricted to a more specific geographic range. Still, among the supposed candidates O. prolifica is thus far the best candidate for being an adult of a species of Markuelia. O. prolifica could have had a three-phase life history: 1) larval phase, elongate body and mouth cone (“Markuelia-phase”); 2) juvenile phase, elongate body, teethed pharynx; 3) adult phase, bellied body, teethed pharynx. Alternatively, a taxonomic revision will be necessary to substantiate Markuelia as a separate taxonomic unit, as its central diagnostic character is no longer separating it from Ottoia. At least these similarities indicate that Markuelia gives a good hint how earlier developmental stages of O. prolifica have looked like. For fossil insects the reconstruction of ontogenetic trajectories based on closely related species represented by different developmental stages has played an important role (recent review in Haug et al. early view). The same principle can be applied here. As pointed out, character evolution is currently difficult to evaluate among cycloneuralians due to unclear correspondence of structures between the different groups. We will still try to propose possible evolutionary scenarios. An interesting find is the change of body shape of Ottoia prolifica from elongate to bellied. This indicates that specimens that apparently differ strongly in their body shape may well be conspecific. This is a severe problem for phylogenetic reconstructions (see material and methods). For example, the small-sized cycloneuralian Lecythioscopa simplex from the Burgess Shale could represent not a separate species, but a juvenile form of Louisella pedunculata Walcott, 1911 when comparing available morphological details (Figure 5A and 5B). Specimens identified as L. pedunculata mainly differ in having a bellied body. A comparative re-investigation of fossil cycloneuralians focussing on identifying possible conspecificities or, vice versa, corroborating separate species statuses appears advisable. Two principle body shapes are known from modern cycloneuralians. Nematoids (Nematoda and Nematomorpha) are elongate worm-shaped. Scalidophorans (Kinorhyncha, Loricifera and Priapulida; the latter two are united in Vinctiplicata), on the other hand, are less elongate and more bellied in body shape. Both conditions could therefore potentially characterize the ground pattern (morphology of the ancestor) of Cycloneuralia. Ottoia prolifica ontogenetically changes from an elongate body shape towards a more bellied body shape. If we assume that possessing a bellied body throughout the ontogeny is ancestral for cycloneuralians, then the early elongate body shape in the early stages of O. prolifica would represent a larval specialisation. The elongate body shape throughout the entire life in nematoids could then have evolved from such a biphasic ontogeny through paedomorphic heterochronic evolution, i.e., an evolutionary shift of the ontogenetic pattern leading to a more juvenile appearing adult morphotype. Vice versa, if an elongate body throughout the ontogeny is ancestral for cycloneuralians, then the bellied adult phase of O. prolifica would most likely have evolved by peramorphic heterochronic evolution, i.e., an evolutionary shift of the ontogenetic pattern leading a more mature appearing adult morphotype. More precisely, this evolutionary shift would be identified as hypermorphosis, i.e., the adding of a “new stage” at the end of the ontogeny. The absence of the early elongate phase in Scalidophora could then be explained by another event of peramorphic evolution, by pre-displacement, i.e., an evolutionary shift of an event into an earlier phase of ontogeny. Another aspect of the body shape of Ottoia prolifica is interesting, the ventral curvature. Such a curvature appears to be also present in other Cambrian representatives of cycloneuralians (e.g., Figure 5A) and could be seen as simple preservation aspects. Yet it is striking that all specimens of O. prolifica show a distinct ventral-wards curvature. Among modern representatives, nematomorph larvae also are curved ventrally (Figure 5C). Maas et al. have already pointed out similarities of Markuelia and nematomorph larvae. If O. prolifica indeed represents an adult of a species of Markuelia (or as O. prolifica could at least provide us with a hint of the adult morphology of Markuelia), a ventral curvature could have characterized also the early stages of development making Markuelia even more similar to nematomorph larvae. This presumed ventral curvature would be in concordance with an anchoring function of the spines (similar to nematomorph larvae); in an outstretched body posture as often reconstructed for Markuelia it is difficult to envisage such a function [23,26]. Yet, as discussed above (see Material and methods) most fossil cycloneuralians are resolved in phylogenetic analyses close to priapulids, also Markuelia and Ottoia prolifica. This could mean that similarities of fossil cycloneuralians and nematomorph larvae are ancestral or evolved convergently, or that we need to reconsider character conceptualisation. 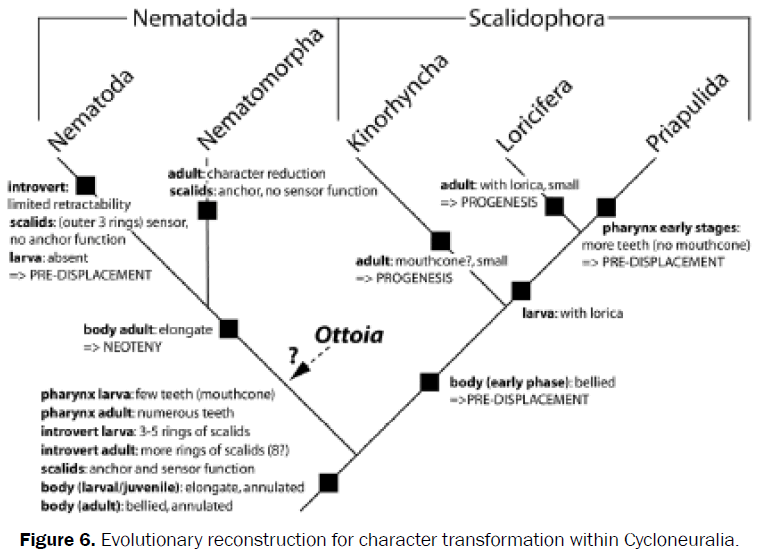 Figure 6: Evolutionary reconstruction for character transformation within Cycloneuralia. 1) Introvert: The introvert could represent an autapomorphy of Scalidophora. This region is quite different from the introvert of nematomorph larvae. Yet, difference does not necessarily mean non-homology, but could mean a derived state in one or even both of the two cases. Additionally, some nematodes possess a limited retractability of their anterior region . Thus, an introvert could well have characterized the stem-species (ancestor) of Cycloneuralia. The ability to retract that region must then have been lost (or reduced) in the adult phase of the ancestor of Nematoida, and more or less completely lost in Nematoda. 2) Scalids: Scalidophora possess scalids (name! ), which have sensorial, as well as anchoring function during locomotion. Nematomorph larvae have hooks on their introvert with exclusive anchoring function. Nematodes possess three rings of cephalic sensory papillae, i.e., sense organs. Usually these three structures are not compared, at most nematomorph hooks and scalids are taken into consideration. Maas et al . for example discussed the possibility that scalids evolved from non-sensorial hooks. Yet, it is as parsimonious to reconstruct scalids as an ancestral feature for cycloneuralians. The stem-species of Cycloneuralia would have been characterized by an anterior region armed with rings of structures with two functions: sensation and anchoring during movement. The sensorial function was then lost in the lineage towards nematomorphs. In the lineage towards nematodes the anchoring function was lost (very likely in coupling with the reduction of the retractability of the introvert). 3) Larval stage: Maas et al . have argued that a larva was part of the ground pattern (= set of characters of the ancestor) of Cycloneuralia. Other authors have argued for direct development. One argument in this discussion was Markuelia, interpreted as being a direct developer . Without knowing the adult such a conclusion remains weak. If Markuelia indeed is an early stage of Ottoia prolifica or its relatives, then it possesses a clear larval feature, the mouth cone. Even if we assume that other Cambrian cycloneuralians are possible candidates for being the adult of Markuelia, a mouth cone is found in none of them; they all exhibit a “normal” toothed pharynx; therefore, a mouth cone could characterize only an early stage in life history. Among modern representatives, larval nematomorphs possess a mouth cone, as well as loriciferans. The latter have a mouth cone throughout their entire life, yet based on other characters it is clear that the loriciferan adult evolved through paedomorphosis and is indeed larviform. Also other extant forms in which the pharynx of the adult might be interpreted as a mouth cone, such as in Kinorhyncha or Meiopriapulus fijensis Morse, 1981, are tiny and best understood as paedomorphically evolved. A mouth cone could in conclusion be interpreted as a larval feature (as it is substituted by, or better transformed into a toothed pharynx in the later stages) that characterized the ground pattern of Cycloneuralia. With such an evolutionary reconstruction (and aspects discussed further above) Ottoia prolifica could not only be interpreted as closely related to priapulids, but also well as a derivative of the lineage towards Nematoida. All presumed scalidophoran characters of O. prolifica (and other Cambrian cycloneuralians) would represent nothing else then plesiomorphies retained from the stem species of Cycloneuralia. Other aspects shared by Markuelia and nematomorph larvae could then represent novelties, “dragging” O. prolifica onto the nematoid branch. As stated above, this evolutionary scenario is not seen as the only possibly one, yet it appears not to rely on more assumptions than others, thus is equally parsimonious. Under different topologies of the phylogeny the evolutionary reconstructions could still look similar concerning the character evolution. For example, it has been proposed that Loricifera is the sistergroup to Nematomorpha [21,54,55]. Under this supposed topology (although introducing character conflicts concerning, e.g. the lorica) most “standard” scalidophoran characters would need to have been present in the cycloneuralian ground pattern as well, and supposed to be lost in Nematoda and adult nematomorphs. Other recent phylogenetic analyses have supposed other complex topologies that would in part also suggest that many scalidophoran characters are in fact already present in the cycloneuralian ground pattern (Figure 3C) . Hence the reconstruction presented here, concerning the appearance of characters, is not diverging from other current discussions. In this light it is important to point out: for evaluating which evolutionary reconstruction reflects the true evolutionary history of Cylconeuralia a strict comparative re-investigation of fossil and extant species including developmental data is necessary. Careful and detailed character conceptualisations are a cruzial starting point for such an enterprise. 1) The morphology of Ottoia prolifica differs in certain aspects from earlier reconstructions: e.g. scalids of the introvert are arranged in 30 or more radii instead of 28; the trunk end bears six hook- or sickle shaped tails spines instead of eight. 2) The ontogeny of O. prolifica is characterized by a change of the body shape from an elongate worm-shaped body to a more bellied adult body shape. 3) Based on current knowledge, Markuelia cannot be differentially diagnosed from Ottoia. Ottoia prolifica is a potential adult of a species of Markuelia. 4) Current hypotheses of structural homology among Cycloneuralia need to be re-evaluated, including fossils, developmental data, and developmental data of fossils. We are grateful to K. Gajapathy, University of Jaffna, and J. Vannier, University of Lyon, who provided very helpful comments on the manuscript. We would like to thank D. Waloszek and A. Maas, University of Ulm, V. Hartenstein, University of California, Los Angeles, and D.E.G. Briggs, Yale University, New Haven, for discussions and helpful suggestions. D.H. Erwin, K. Hollis and M. Florence provided us access to the USNM collections. Many thanks to the programmers of freely available software used in this study such as Blender and Open Office. J.T.H was kindly supported by Yale University and by the Alexander von Humboldt- Foundation (AvH) with a Feodor Lynen fellowship for postdoctoral researchers and a return fellowship. C.H. was supported by the German Academic Exchange Service (DAAD) with a return fellowship. Both authors would like to thank their past hosts, S. Harzsch, University of Greifswald, and D.E.G. Briggs, for their support. Maas A et al. The ‘Orsten’–more than a Cambrian Konservat-Lagerstätte yielding exceptional preservation. Palaeoworld. 2006; 15:266-282. Müller KJ and Walossek D. Skaracarida a new order of Crustacea from the Upper Cambrian of Västergötland, Sweden. Fossils Strata. 1985; 17: 1-65. Müller KJ and Walossek D. External morphology and larval development of the Upper Cambrian maxillopodBredocarisadmirabilis. Fossils Strata. 1988; 23: 1-70. Conway MS. The community structure of the Middle Cambrian phyllopod bed (Burgess Shale). Palaeontology. 1986; 29: 423-467. Vannier J and Chen J.Early Cambrian Food Chain: New evidence from fossil aggregates in the Maotianshan Shale Biota, SW China. Palaios. 2005; 20: 3-26. Vannier J et al. Early Cambrian origin of modern food webs: evidence from predator arrow worms. ProcBiol Sci. 2007; 274: 627-633. Dunne JA et al. Compilation and network analyses of cambrian food webs.PLoS Biol. 2008; 6: e102. Haug JT et al. A Marrella-like arthropod from the Cambrian of Australia: A new link between “Orsten”-type and Burgess Shale assemblages. ActaPalaeontol Pol. 2013; 58: 629-639. Müller, KJ. Crustacea with preserved soft parts from the Upper Cambrian of Sweden. Lethaia. 1983; 16: 93-109. Walossek D. The Upper Cambrian Rehbachiella and the phylogeny of Branchiopoda and Crustacea. Fossils and Strata. 1993; 3: 1-202. Haug JT et al. Ontogeny of two Cambrian stem crustaceans, †Goticarislongispinosa and †Cambropachycopeclarksoni. Palaeontographica A. 2009a; 289: 1-43. Haug JT et al. Henningsmoenicarisscutula, †Sandtorpiavestrogothiensis gen. et sp. nov.andheterochronic events in early crustacean evolution. Earth EnvironmSci Trans R SocEdinb. 2010a; 100: 311-350. Haug JT et al. High-level phylogenetic analysis using developmental sequences: The Cambrian †Martinssoniaelongata, †Musacarisgerdgeyeri gen. et sp. nov.and their position in early crustacean evolution. Arthropod Struct Dev. 2010b; 39:154–173. Duan B et al. New palaeoscolecid worms from the Furongian (upper Cambrian) of Hunan, south China: Is Markuelia an embryonic palaeoscolecid? Palaeontology. 2012; 55: 613-622. Maas A et al. Maotianshan-Shale nemathelminths - Morphology, biology, and the phylogeny of Nemathelminthes. PalaeogeogrPalaeoclimatPalaeoecol. 2007a; 254: 288-306. Maas A et al. Loricate larvae (Scalidophora) from the Middle Cambrian of Australia. MemAssoc Australasian Palaeontol. 2009; 37: 281-302. García-Bellido DC and Collins DH. A new study of Marrellasplendens (Arthropoda, Marrellomorpha) from the Middle Cambrian Burgess Shale, British Columbia. Canadian Journal of Earth Sciences. 2006; 43: 721-742. Haug JT et al. Functional morphology, ontogeny and evolution of mantis shrimp-like predators in the Cambrian. Palaeontology. 2012; 55: 369-399. Whittington HB. Rare Arthropods from the Burgess Shale, Middle Cambrian, British Columbia. Philosophical Transactions of the Royal Society of London, Series B, Biological Sciences. 1981; 292: 329-357. Haug JT et al. Sarotrocercusoblitus – small arthropod with great impact on the understanding of arthropod evolution? Bull Geosci.2011; 86: 7250-736. Peel JS et al. Life cycle and morphology of a cambrian stem-lineage loriciferan.PLoS One. 2013; 8: e73583. Haug JT et al. A new species of Markuelia from the Middle Cambrian of Australia. MemAssoc Australasian Palaeontol. 2009b; 37: 303-313. Dong X et al. The anatomy, taphonomy, taxonomy and systematic affinity of Markuelia: early Cambrian to early Ordovician scalidophorans. Palaeontology. 2010; 53: 1291-1314. Bohall PJ et al. External morphology of larvae of Chordodesmorgani (Nematomorpha). Invertebr Biol. 1997; 116: 26-29. Conway MS. Fossil priapulid worms. Spec Pap Palaeontol. 1977; 20:1-95. Vannier J. Gut contents as direct indicators for trophic relationships in the Cambrian marine ecosystem.PLoS One. 2012; 7: e52200. Bengtson S. Teasing fossils out of shales with cameras and computers. Palaeontol Electron. 2000; 3: art 4. Legg D. Multi-segmented arthropods from the Middle Cambrian of British Columbia (Canada). Journal of Paleontology. 2013; 87: 493-501. Wills MA et al. The disparity of priapulid, archaeopriapulid and palaeoscolecid worms in the light of new data.J Evol Biol. 2012; 25: 2056-2076. WirknerCS and Richter S. Evolutionary morphology of the circulatory system in Peracarida (Malacostraca; Crustacea). Cladistics. 2010; 26: 143-167. Huang D et al. Discussion on the systematic position of the Early Cambrian priapulomorph worms. Chin Sci Bull. 2006; 51: 243-249. Harvey TH et al. Are palaeoscolecids ancestral ecdysozoans?Evol Dev. 2010; 12: 177-200. Maas A et al. A possible larval round worm from the Cambrian ‘Orsten’ and its bearing on the phylogeny of Cycloneuralia. MemAssoc Australasian Palaeontol. 2007b; 34: 499-519. Liu Y et al. The oldest known priapulid-like scalidophoran animal and its implications for the early evolution of cycloneuralians and ecdysozoans.Evol Dev. 2014; 16: 155-165. Snively E and Cox A. Structural mechanics of pachycephalosaur crania permitted head-butting behavior. Palaeontol Electron. 2008; 11: 3A. Horner JR and Goodwin MB. Extreme cranial ontogeny in the upper cretaceous dinosaur pachycephalosaurus.PLoS One. 2009; 4: e7626. Longrich NR et al. Texacephalelangstoni, a new genus of pachycephalosaurid (Dinosauria: Ornithischia) from the upper CampanianAguja Formation, southern Texas, USA. Cretac Research. 2010; 31: 274-284. Bengtson S and Zhao Y. Fossilized metazoan embryos from the earliest Cambrian. Science. 1997; 277: 1645-1648. Dong XP et al.Fossil embryos from the Middle and Late Cambrian period of Hunan, south China.Nature. 2004; 427: 237-240. Dong XP et al. The anatomy, affinity, and phylogenetic significance of Markuelia.Evol Dev. 2005; 7: 468-482. Donoghue PC et al. Fossilized embryos are widespread but the record is temporally and taxonomically biased.Evol Dev. 2006a; 8: 232-238. Dong X. Developmental sequence of Cambrian embryo Markuelia. Chin Sci Bull. 2007; 52:929-935. Cheng G, et al. Internal structure of Cambrian fossil embryo Markuelia revealed in the light of synchrotron radiation X-ray tomographic microscopy. ActaGeolSin . 2011; 85: 81-90. Zhang X et al. Embryonic development of a middle Cambrian (500 Myr old) scalidophoran worm. J Paleontol. 2011; 85: 898-903. Budd GE. Palaeontology: lost children of the Cambrian.Nature. 2004; 427: 205-207. Donoghue PC et al. Synchrotron X-ray tomographic microscopy of fossil embryos.Nature. 2006b; 442: 680-683. Adrianov AV and Malakhov VV. Symmetry of priapulids (Priapulida). 1. Symmetry of adults. J Morphol. 2001a; 247: 99-110. Adrianov AV and Malakhov VV. Symmetry of priapulids (Priapulida). 2. Symmetry of larvae.J Morphol . 2001b; 247: 111-121. Wennberg SA et al. Early embryonic development of the priapulid worm Priapuluscaudatus.Evol Dev. 2008; 10: 326-338. Adrianov AV and Malakhov VV. The phylogeny and classification of the phylum Cephalorhyncha. Zoosyst Ross. 1995; 3:181-201. Malakhov VV and Adrianov AV. Cephalorhyncha – a new phylum of the animal kingdom. KMK Sci Press, Moscow. 1995. Storch V and Higgins RP. Scanning and transmission electron microscopic observations on the larva of Halicryptusspinulosus (Priapulida). J Morphol. 1991; 210: 175-194. Nielsen C. Animal Evolution: Interrelationships of the living phyla. (1st Ed) University Press, Oxford. 1995; pp: 467. Sørensen MV et al. New data from an enigmatic phylum: evidence from molecular sequence data supports a sister-group relationship between Loricifera and Nematomorpha. Journal of Zoological Systematics and Evolutionary Research. 2008; 46: 231-239. Neves RC et al. A complete three-dimensional reconstruction of the myoanatomy of Loricifera: comparative morphology of an adult and a Higgins larva stage. Frontiers in Zoology. 2013; 201: 10-19. Yamasaki H et al. Phylogenetic position of Loricifera inferred from nearly complete 18S and 28S rRNA gene sequences. Zoological Letters. 2015; 1:18.